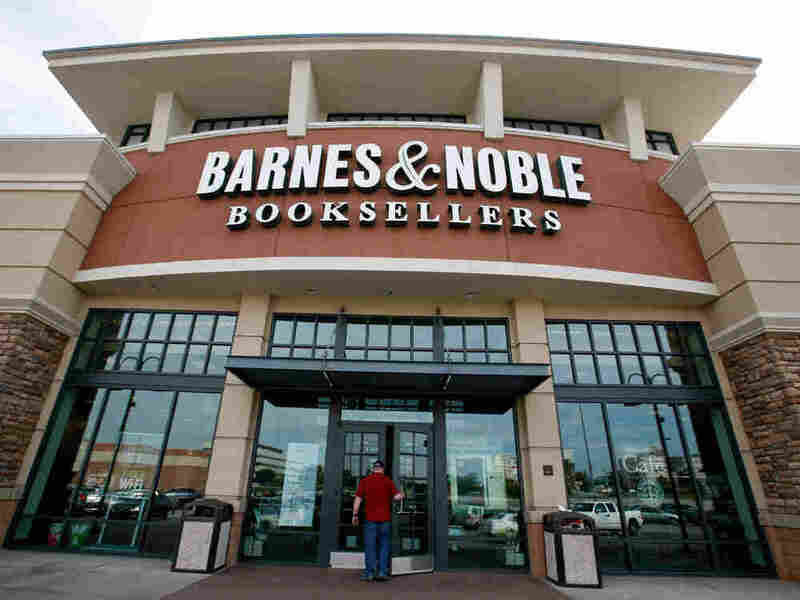 Book News: Barnes & Noble Founder Pulls Plug On Buyback Plan : The Two-Way Also: James Patterson on bad books; remembering Elmore Leonard; the woman who inspired "Terry, the Mexican girl" in On the Road dies. A Barnes & Noble store in Bethel Park, Pa.
Barnes & Noble, the bookstore chain nowadays rarely divorced from the word "struggling," reported more bad news Tuesday. Founder Leonard S. Riggio announced he had suspended his plans to buy the company's nearly 680 bookstores — right as the chain reported a quarterly net loss of $87 million. Riggio said in a statement: "While I reserve the right to pursue an offer in the future, I believe it is in the company's best interests to focus on the business at hand." The New York Times' DealBook reports that after Riggio's February announcement that he planned to purchase the stores, he "struggled with whether to follow through on his proposal, according to a person briefed on the matter. Mr. Riggio never made a formal offer to the board, and in recent weeks became leery of both the shareholder lawsuits that might arise from any bid and the distraction it might become to the company." Shares of Barnes & Noble fell 12 percent in trading Tuesday. NPR's Noah Adams recalls the great crime novelist Elmore Leonard, who died Tuesday morning at age 87: "Leonard had wonderment in his soft voice. He'd remember characters he'd dreamed up — the confused victims, the steel-willed but often blundering bad guys. I loved hearing him talk, and I'd already asked him to read several pages of his work. You could hear the New Orleans of his birth and the pure fun of creating the plots. I found myself wishing I'd asked for another day in his world." Robyn Creswell considers the Egyptian novelist and dissident Sonallah Ibrahim: "Ibrahim has become a sort of oracle for many Egyptian students and writers... Along with his fiction, Ibrahim is revered for having publicly refused the Arab Novel Award, a prize given by the Egyptian Ministry of Culture, under Mubarak. In 2003, Ibrahim attended the awards ceremony, but instead of delivering an acceptance speech he excoriated the regime for its feckless foreign policy, its endemic corruption, and its use of torture, all of which, he said, gave him no choice but to refuse the prize." James Patterson tells The New York Times about his favorite books: "I avoid the same kinds of books that I do people — long-winded, sanctimonious, goody two shoes, self-important, mean-spirited." Beatrice Kozera, the woman who inspired "Terry, the Mexican girl" in Jack Kerouac's novel On the Road, died Thursday at age 92, The Associated Press reports. The report added, citing a family friend, that "Kozera learned only a few years ago that her 15-day relationship with Kerouac in the farmworker labor camps of Selma in 1947 was featured in his famous Beat Generation novel and eventually a movie."